I know you’re saying “Alan you hate controlling things only from your phone, you said so when you said don’t buy smart bulbs, buy smart switches“. To that I say, yes I do had that but the devices we are about to discuss are exceptions to that rule. Unlike lights these devices require you to physically interact with them to use them and usually have cords that are within arms reach. To control them with out smart tech you would switch them on at the device or plug them in to the wall. For this reason smart plugs are a great way to make sure that dangerous devices stay off when not being used or to let smart devices turn themselves off automatically when they are done with their task. There are a lot of different smart plugs out there. Some are actually very inexpensive and will do the job perfectly for you. But if you want more control over you plug, like adding it to a home automation system, then they might not be the best for you. For these reasons we are going to be using the Sonoff Basic. It’s a great device that is compatible with an ESP8266 Arduino and a relay fitted together and solf for less than it would cost to buy the individual components. It’s great hardware and very easy to work with, so let’s just wire it up. We are going to be wiring mains wiring directly into the Sonoff Basic so if you’re unfamiliar with the risk of that then look it up. The short version is that electricity is a tool and, like most tools, it can kill you if you’re careless. 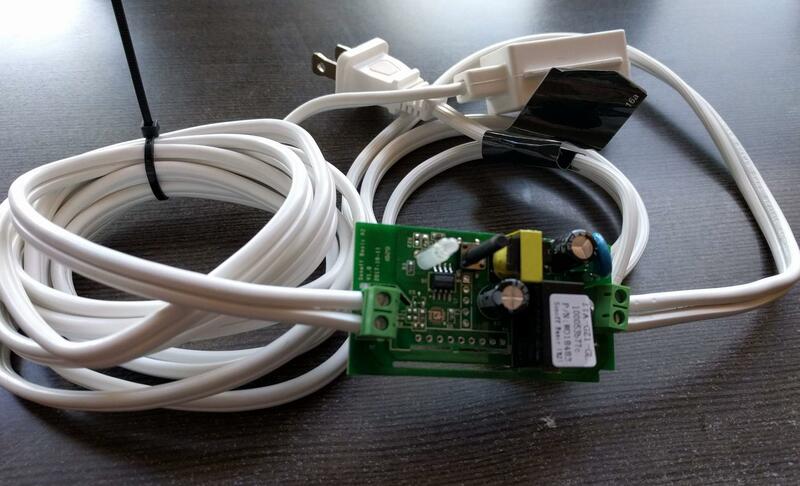 The Sonoff Basic is actually well named and is surprisingly basic. It has input and output terminals for neutral and line and nothing more. The process for wiring it up is equally basic. Essentially we are going to be cutting an extension cord and putting the Sonoff in the middle of it. This lets the Sonoff pull power from the wall but also lets it control the flow of power to the devices plugged into it. The first thing you need is an extension cord. I like getting mine from big box stores because usually you can find them for around $1.50. In the US extension cords have two prongs, one larger than the other. The larger one is the neutral side and the smaller one is the line. Also, the neutral side of extension cords sometimes have small ridges that run the length of the cord, but not always. Cut the extension cord at a place where you want to put the Sonoff. Give yourself a few inches of wiring to work with. Strip the insulation from the cord and basically just insert the neutral into the neutral input and the line into line input then do they same for the output side. After that you can plug the cord in, install the eWeLink app to your phone and setup the plug. The eWeLink app works exactly how you expect but if you want more advanced features you can do a bit more work and get all the features you could want. I’ll be covering that in another post but in the meantime if you have any questions leave a comment of find me on Twitter. « The Best 3D Printer?